Of all the cities we visited in Vietnam, Ho Chi Minh City was by far the most modern! Whilst driving through the streets to reach our hotel, the only giveaway that it was a Vietnamese city was the insane amount of scooters constantly racing past you. Hidden away in between the modern shops and the typical city-looking streets you can still find touches of the old Vietnam. You can find some delicious traditional cuisine and you will also find museums that will teach you about the all important history that lies here! Whilst we didn’t feel the need to stay around in Ho Chi Minh City for very long, this city definitely deserves a few days of your holiday time: time to venture out on a day trip or two, as well as a full day to explore the top Ho Chi Minh City attractions! The attractions that we have listed on the list below are all within walking distance of each other. We highly recommend that you tackle the attractions by foot, as you will find loads of Vietnamese touches on the streets that you can pass by! I think there is something to be said for the travellers who walk through the major cities in Vietnam! The challenge of trying to cross the ridiculously scooter-busy roads, somehow feeling proud when you make it to the other side safe and sound! Observe the bicycles that are completely filled to the brim with baskets or bread or toys galore. We walked past a school and watched the cute little Vietnamese kids out having a play during their break! I love to check out the little street food stalls, always intrigued with what they are making! Have a chat with some of the friendly locals, what better way to learn more about their culture than to befriend them! All these things that you miss when you grab a taxi from one spot to the next! So pop on your walking shoes, download an offline GPS map for Ho Chi Minh City and make a list of these 5 things to see in the city! Further Reading: Short on time and wondering about whether to see Hanoi or HCMC? Click here to read a post that will help you decide. 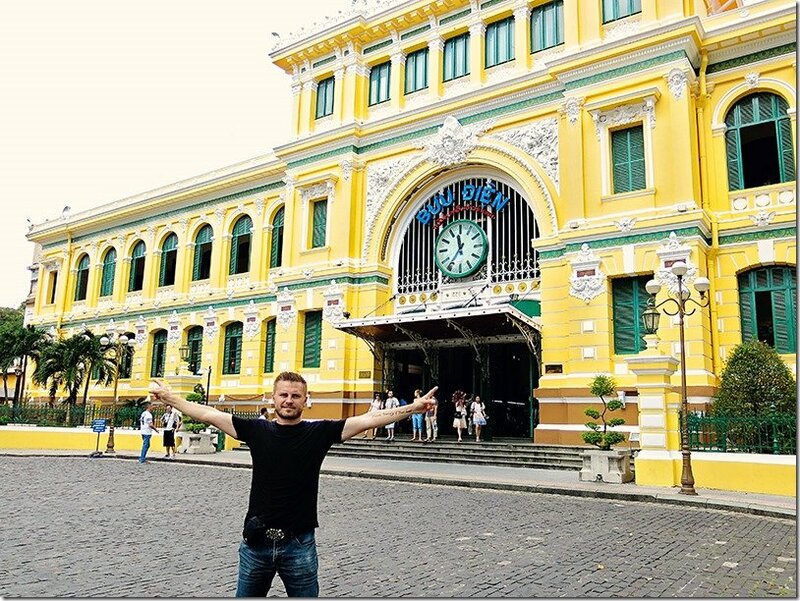 Top 5 Ho Chi Minh City Attractions you simply have to See! The Thai Binh Market is a great place to start your day of exploring! Why not tantalise your taste buds and enjoy your breakfast true Vietnamese style! We fell head over heels in love with Pho for breakfasts, something I miss very much since the trip to Vietnam! You might also feel like a glass of delicious Ca Phe Sua Da, yummy strong, cold Vietnamese coffee with a good dose of condensed milk! (read our post on Vietnamese coffee styles here). Enjoy the vibe of the markets whilst checking out the local buzz of activity! You will find the Thai Binh Market at the end of Pham Ngu Lao. 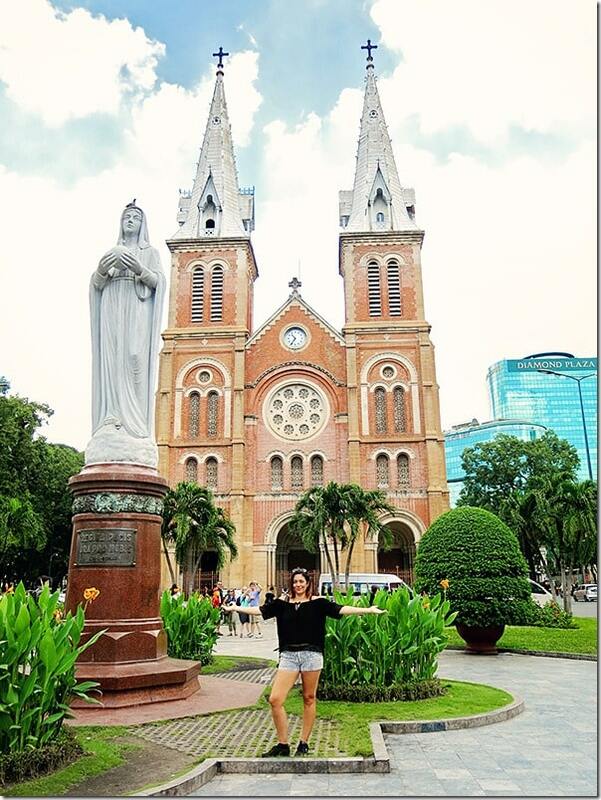 If you are up for a bit of a walk, why not head towards the stunning Saigon Notre-Dame Basilica located on Ð Han Thuyen. The glorious Notre Dame Cathedral is massive in size, and very hard to miss! 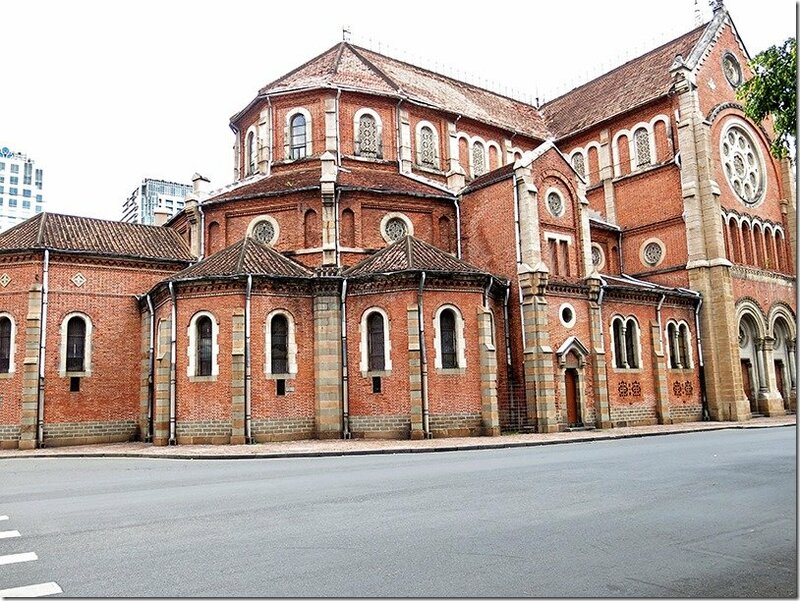 It is famous for its French colonial architecture; red brick in design; said to have been built between 1877 and 1883. 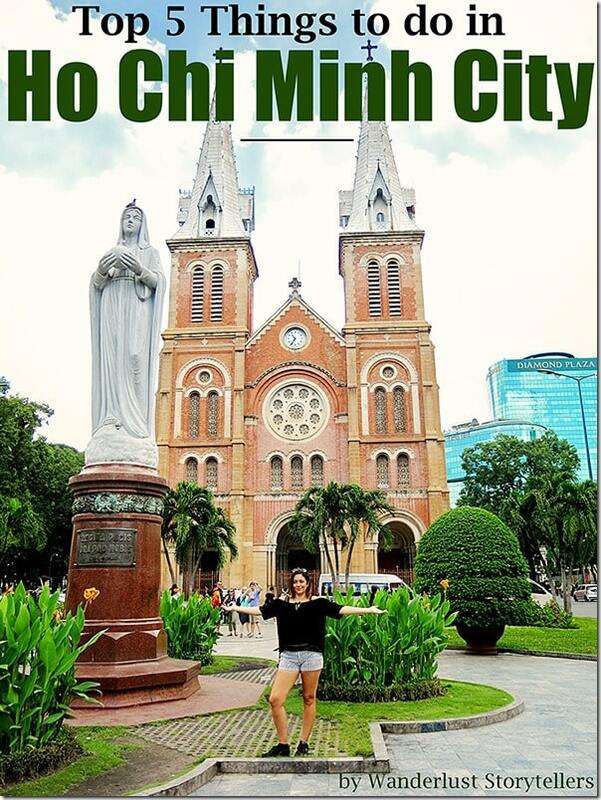 You can visit the Ho Chi Minh City Notre Dame from 9am to 11am Monday to Saturday. Right across the street you will see a gorgeous yellow building. The Saigon Central Post Office was constructed when Vietnam was part of French Indochina in the late 19th century. 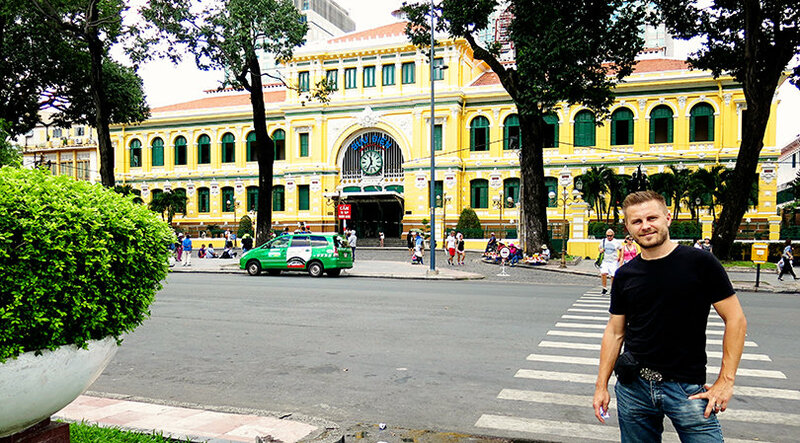 It happens to be one of the oldest and largest post offices in Saigon! A quick visit to the Central Post Office, Ho Chi Minh City, is in order. It won’t take you long to have a little look around here. The main hall itself is pretty impressive and make sure to check out the beautifully painted maps of Greater Saigon, and Southern Vietnam and Cambodia that were created just after the post office was built. The Reunification Palace (formerly known as the Independence Palace) is an important landmark in Saigon. Whilst we chose not to visit the Palace due to time constraints, we do recommend you take the time to explore the museum. This building’s importance stems from the fact that it was the place where the war came to an end. The building now is a museum where you can learn about the country’s war-time history! Admission fees are applicable at the Palace. From Saigon Post Office, it will take you around 10 minutes to walk to the Reunification Palace, located at the crossroads of Nguyen Thi Minh Khai-Nam Ky Khoi Nghia. 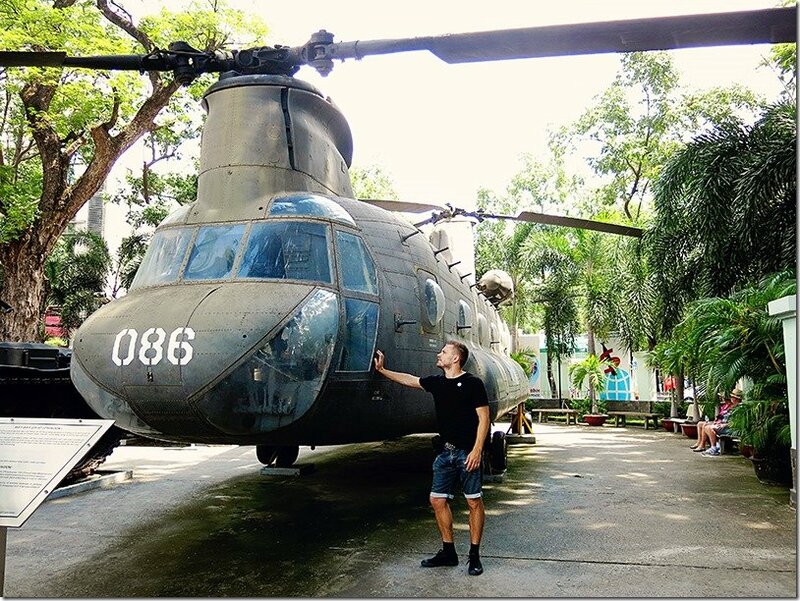 You simply cannot visit Ho Chi Minh City and not stop by at the Vietnam War Museum! The War Remnant Museum is around the corner from the Reunification Palace. The National Vietnam War Museum requires a few hours of your time. There are heaps to explore here, from aircrafts used during the war, to setups of what the prison cells looked like. Inside the building, you will find loads of Vietnam war crimes photos and information as well as personal stories told by those that survive this horrific time in history! It is a great way to learn more about the history that forms such as important part of ‘who’ this country is. Admission fees are applicable at the War Remnants Museum. The War Remnants Museum is located on Vo Van Tan Street. Click here to grab more ideas of what to do whilst in HCMC. Still wondering where to stay in HCMC? We love this comprehensive list on Taylor's Tracks to find the best option on where to stay. We have two recommendations of where you can enjoy your meal for the day! One to suit those who like to eat from the street, experiencing their destination to the fullest; whilst the other option offers a classy relaxed Vietnamese style dining experience! Both have delicious food so it is a matter of choosing which atmosphere you would most enjoy! We saw Ms. Nguyen Thi Thanh rotating lunch stall on Anthony Bourdains No Reservations series! Since being featured, she has become mighty popular amongst travellers! The famous Saigon’s Lunch Lady is unique in that she offers different Vietnamese noodle soup dishes depending on the day of the week. You can read more about here. Our advice is to grab a taxi from the museum to visit her stall. 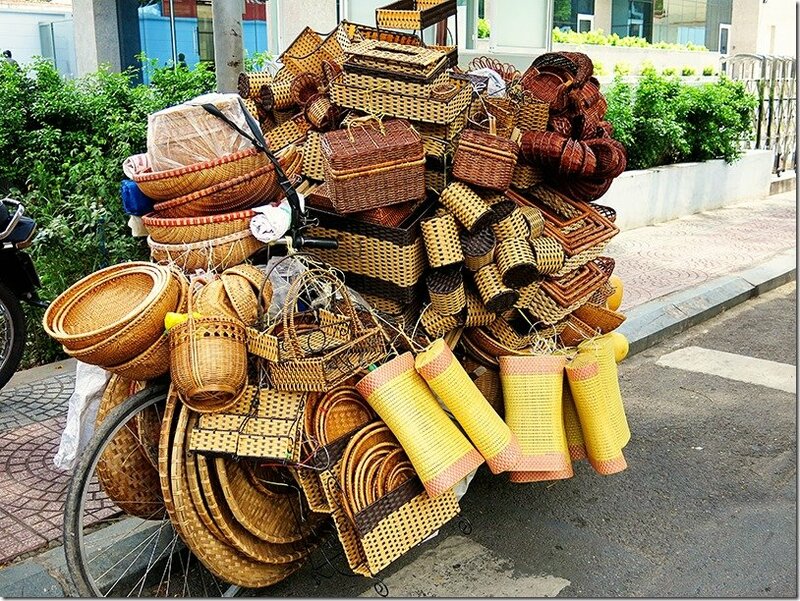 The Lunch Lady will be along Phường Đa Kao street near the riverside. Enjoy your meal! 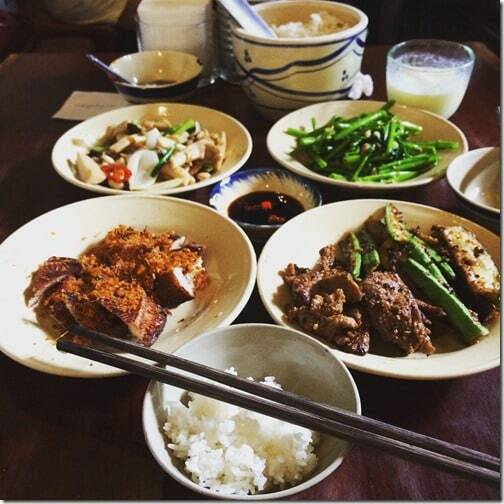 Another hot favourite of ours is Cuc Gach Quan Restaurant! Again best to grab a taxi to visit this one and don’t be surprised by the small alley and slightly hidden away entrance to the little restaurant! Apparently this little gem is the hot favourite restaurant for Brad and Angelina Jolie when they visit Saigon! I’m not sure how much truth there is behind the statement, but regardless the food here was super delicious and we were impressed by the friendly service (they even shared with us a brief outline of the recipe of one of their dishes that we loved very much!!) Do yourself a favour and make sure you stop by this one during your stay in Ho Chi Minh City! One of the most popular reasons why travellers base themselves in HCMC is to visit the Cu Chi Tunnels. This tour will take up half a day of your time, with a choice between a morning or afternoon timeslot! Go underground in Cu Chi to discover the vast tunnel network built by resourceful guerrilla fighters during the Vietnam War. Learn more about the history, and unforgettable experience! 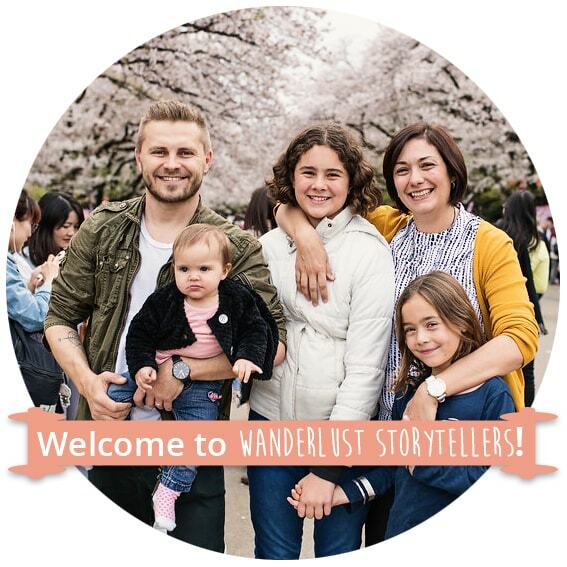 We recommend you book your tour through Viator, click here to see more details about this popular tour option! Of course everyone who visits the south of Vietnam is there in order to visit the world renown Mekong Delta! Enjoy a cruise along the mighty Mekong in a longtail boat. Experience this important river delta as you explore both jungle-shaded canals and wide waterways to see fishing villages, exotic fruit farms and the rhythms of daily life! 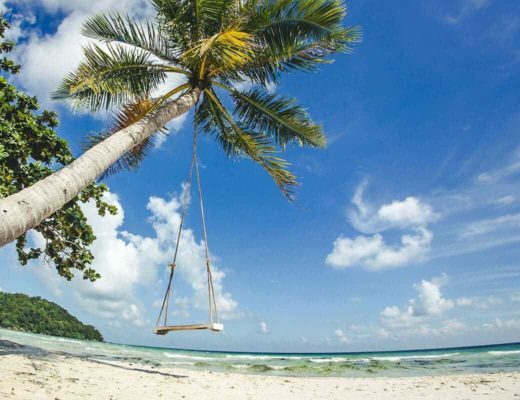 Ride in a sampan along canals shaded by coconut trees – how cool is that!! This tour will take up around 8 hours of your time! To see more about this highly recommended Viator tour, click here! 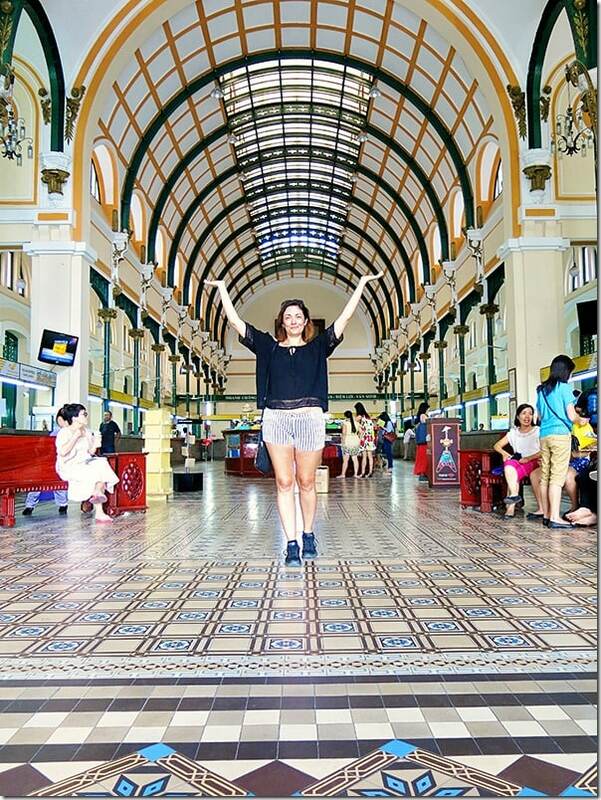 Are you planning a stay in Ho Chi Minh City? Which of the 5 Ho Chi Minh City attractions would you like to see most? Why? 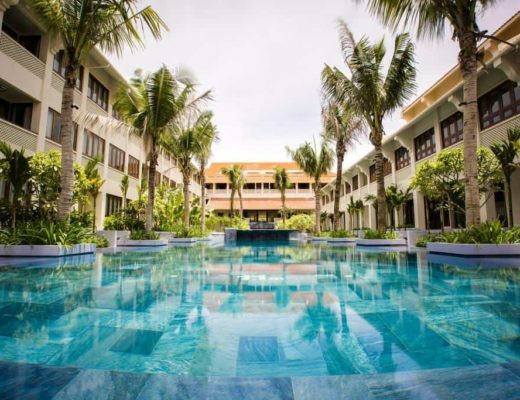 See our list of recommended Vietnam Accommodation options! After some tips for your travels to Vietnam? Read our in-depth post to get yourself prepared here! Hi Greg, for sure! You can’t take photos of what emotions you will experience when you walk around the museum.